Today was a grand improvement from yesterday. We purposely got a slow start and didn't leave the hostel until 10ish. Gave us time to try out our new Sham-Wow like towels and play around on the internet and plan our day before setting out. We decided to hit the Toji temple first. It is the location of the tallest pagoda in Japan (5 whopping stories) We didn't spring for the whole admission, but got to enter the temple, the main hall and the lecture hall. Each had tons of golden buddhas, that almost tried to outdo each other. The grounds of the temple were really pretty as well, there was a large pond and tons of flowers. We had a nice relaxing late breakfast there people watching of green tea ice cream and rice cakes. We then hiked back to Kyoto station with the hope of finding the sushi resturant that was recommended on Wikitravel and by our hostel. It was somewhere in Kyoto station's 12 floors, and we had a picture and name...should be easy right?! Well the hostel gave us somewhat backward directions so we were wandering all over the lower mall and then back through the JR terminal before we found someone who knew where we were trying to go. We had been on the verge of throwing in the towel, and were so glad we didn't! The place was so much fun as we sat at the counter and just picked out what we wanted as it cruised by on the conveyor belt. They charge you by what color plate you pick up and just total your plates at the end. We got to try some new things and left with only a $8 and some tab, hard to beat! Guess sushi is growing on me. Then it was off to the bamboo forest of Arashimaya. They aren't kidding that Kyoto's landmarks are all spread out, we had to take the JR almost 30 minutes to get to the Arashimaya area. From there we had a decent walk to the bamboo forest. Each side had tons of bamboo growing and it was dark, quiet, and cool there. Really glad we went. 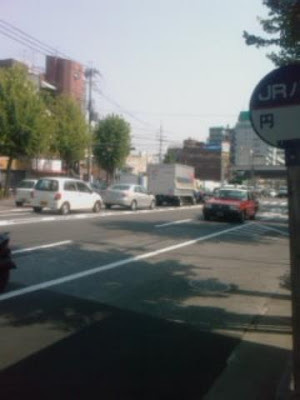 From there we took the JR to Enmachi area. We thought we would be sneaky and avoid getting the city bus pass (after we found out we couldn't get the all day passes in Enmachi) and just take the JR buses through town. The downside to our plan...JR buses are not very frequent and do not run to every bus stop. Ended up missing our bus, and had to wait out about 30 more mins for the next one to take us just a little farther from where we wanted to go, but it really saved out feet. Kinkaku-ji was well worth the effort! The pavilion is covered in gold leaf and sits on a beautiful pond. The gardens surrounding it were very pretty as well. There were a ton of people there though all clamouring for pictures of the pavilion. We went at high sun, so was hard to get pictures that were up to Charlton's standards (oh well!) Then it was back to the station, this time catching the JR bus quickly (we didn't have to wait) and off we went back to Kyoto. Kiyomizu-dera was our last temple on our to-do list. However, our plan of taking the JR buses everywhere today was foiled when there were no lines out to the temple. We knew there was no way we were going to walk it, and the subway was not a reliable option as we had seen from yesterday so we bit the bullet and bought an all day bus pass. We took it straight to where we needed to go, with only a small uphill hike past more shops (more goodies for us to sample). When we got to the temple, it was absolutely gorgeous! It is nestled in the trees and almost looks like it is suspended. Totally Swiss Family Robinson like...had they built a multi level temple, with two pagodas in Japan (ha!) After hustling some more samples we headed to the geisha district of Gion. We didn't have a set walk planned for Gion, but just hoped to wander through the old buildings and see us a geisha. We weren't there for more than 10 minutes when we turn a corner and it looks like the paparazzi are there for Britney Spears. We hung around for a little with all the other gawkers and were treated to a couple geisha sightings. We then walked the rest of the neighborhood and then caught the bus back through the major designer shopping district before coming back to the hostel. After a quick break we headed out for Yakitori for dinner at a restaurant recommended by the hostel. It fit all of our criteria - good and cheap! It was the tiniest little place just around the corner from our hostel and we shared the counter with only one other person. Gave us the chance to watch our chef at work as he grilled out chicken livers, stomach and mushroom skewers. Everything was really good, and Charlton was happy I tried some new things. We then hit the Circle K on the way home for dessert before watching our slingboxed American Idol and Dhani tackles the Globe. We both have gotten cleaned up for tomorrow as we have a tour of the Imperial Palace at 10, and have to check out here and drop our bags at the station before then. After that we make our way on to Osaka with a stop in Nara for the afternoon. Almost to the Golden Temple! So yesterday we got up as early as our bodies would allow given the freezing condition of our room in Takayama. Got to the JR station just in time for our 6:50 train to Kyoto. The transfer in Nagoya was painless and we actually had very little time to wander around. We got to Kyoto around noonish and booked it for our hostel. Our luck once again had us coming out on the wrong side of the station and having to walk way out of the way to get back to where we should have come out (with backpacks not fun) finally got to our place and the room wasn't ready so we took off in search of food and some sights. We headed back to the station for some grub as the Kyoto station is 12 stories of department store, station and food court. Charlton got some Dashimaki Tamago, which are like little egg balls cooked in special pans. I tried my luck at a noodle shop where I had to use a vending machine to place my order. The food was really good, and both our places seemed really popular (always a plus). Then we headed off to the Info Center in the mall and picked up some walking tour information and get some much needed internet time. Then before we left we headed to Mr. Donut for a snack. We picked up a Subway pass having no idea the coverage in Kyoto. We assumed the city was like Tokyo that you never had to go far unitl a subway. We bought our passes and skipped the bus connection service and headed off. We figured we could wing it and hit the 1st walking tour in our handout. We visited the Heian shrine and then went to the Kyoto Folk Crafts center (basically a giant duty free shop disguised as a museum...no wonder it was free) then we headed up the philosopher's walk and walked along the stream under sakura blossoms. We got to the end of the walk at Ginkaku-ji (Temple of the Silver Pavilion). We decided to skip the admittance since it was going to be 5 bucks a piece and the whole thing was being renonvated anyway. We then decided it was time to head back so we could rest and get some dinner. Good plan right?! Well without having bus coverage we had to walk pracitcally across all of Kyoto to get back to the subway. Our walk through town was longer than the philosopher's walk! Finally got back to the hostel HOURS later, and had to carry our lovely backpacks up the stairs (ugh!) to our room. Hooray for wi-fi, private bathroom and a bed! We didn't stay stationary for long and used the hotel recommendations for cheap eats to find a little noodle/curry place just down the street. Got to use the vending machines again and had our curry, which after all the walking was like the best meal ever. We then headed to the grocery store for dessert and came back here to watch some slingboxed shows. We both passed out with the lights on and only woke up when the other hostelers were getting loud. Lucky for Charlton he had packed ear plugs. I was woken up quite a bit last night having to listen to their drunken banter. Oh well, beats freezing in Takayama on a tatami mat. It's about time for us to start getting ready for day two. We are going to make sure we get bus coverage today and try to hit the rest of the major sites. We have an Imperial Palace tour scheduled for tomorrow so other than that today is our last day of touring here, hope the feet can handle it.